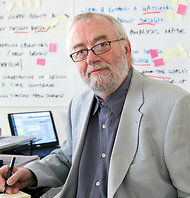 Bill Moggridge was the first person I knew who understood that interaction design could be a revolutionary medium for change. He understood that the screen was a blank canvas with no visible lingua franca. He made everything sound possible and could make the dullest design project sound utterly fascinating — everything seeming somehow more exotic because of his glorious British accent. And he was unpretentious: a rarity among people whose gifts are so extraordinary, and whose contributions to public life are so indelible and rich. I watched, as we all did, as Bill migrated from industrial design guru to museum director, a role that suited him and an institution that seemed worthy of those gifts. To the degree that the Smithsonian is a national treasure, so, too, was Bill Moggridge, who lost his battle with cancer over the weekend. That big beautiful Fifth Avenue mansion and that elegant man with his exquisite accent suited each other perfectly. I last saw Bill Moggridge last summer, when the United States postal service debuted its Industrial Design stamps at the Cooper-Hewitt. Before the event, those of us participating in the first day of issue ceremony gathered in an anteroom, where we were given our marching orders. It was all rather formal, as these things tend to be, except that Bill was so excited about the stamp issue, he couldn't stand still. I wish I could remember what he said — something about how thrilling it was that postage could at once utilitarian and visually striking — and we vowed to get together and talk about how we could do more stamps, better stamps, visually compelling and memorable stamps about subjects with meaning and purpose and broad, public appeal. Broad public appeal was what Bill Moggridge did for a living, never compromising his own aesthetic integrity, his intelligence, or his natural curiosity about the greater good. He was a natural collaborator, who realized that the designer's role was to listen and watch and learn by doing: this was, and is, interaction in the truest sense. And because he made things — real, palpable things like laptops and defibrillators — he leaves behind a material presence that will, by its very nature, endure. But his legacy is much more than that: it is a legacy of taking chances, seeing promise, understanding need, visualizing futures, and everything in between. Many of you will have your own stories about Bill Moggridge, and we invite you to share them here. Bill Moggridge's contribution to higher education should not be overlooked. Anyone who went through the graduate program in design at Stanford during the time he was involved benefitted from Bill's insights, provocations, curiosity and humor. Bill was the proverbial storyteller at the center of our design world. What a lovely tribute to a wonderful teacher. Thank you so much Jessica. 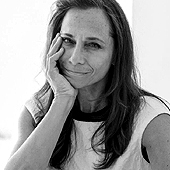 Also see the tribute in the NY Times by Julie Lasky.